Collecting forms is a tedious and challenging task. Returned forms can be incomplete, illegible and/or late. And this is only the beginning of the process. Our online forms solution simplifies form collection, while streamlining the process for everyone involved. The Power Media online forms solution replaces the tedious paper process and eliminates the collection of forms via fax, email or snail mail. 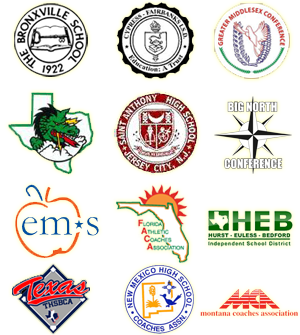 Our staff builds the site for your school or organization and is available for help and form creation throughout our entire relationship. Administrators are given password-protected access to all collected information. Access information collected from your online forms at any time from your school, home or phone. 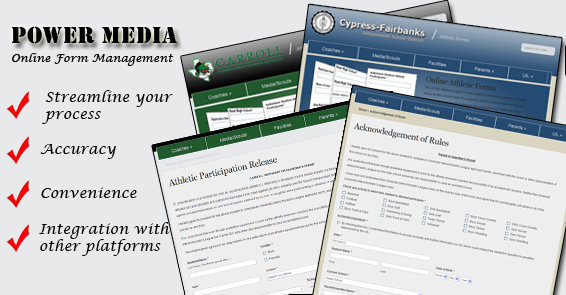 The administrative panel of your website allows you to edit forms, review forms, view all completed entries, update notification emails, duplicate forms or delete forms entirely. This, combined with the ability to export all information to excel, cuts your time managing the form process by more than 50%…giving you more time to focus on your essential duties. Collect information online and view, sort, export and print (if you really want to) entries. All information is easily accessible via your password-protected administrative panel, which makes managing your online forms and entries efficient and timely. Both administrator and user notifications are sent upon submission with the admin having built-in routing option to route the email notification to a specific member of your team based on form selections. Administrators are notified immediately after submission, giving you the opportunity to respond quickly if needed. Users receive a one-time auto-responder message to confirm delivery of the form. They have piece of mind knowing that their form has been received. View all entries for any of your forms. 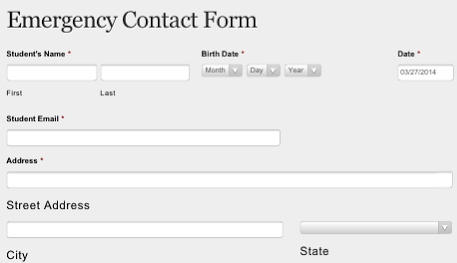 Need to access entries from your ’emergency contact information form’? 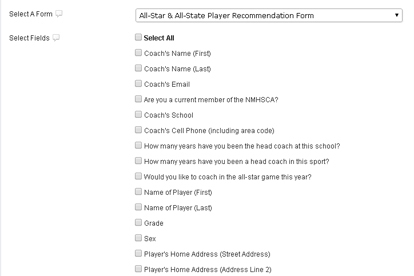 Simply select entries for a list of all who completed the form. Need to take it a step further and pull entries for your softball team? Search the term ‘softball’ and all softball results will appear. 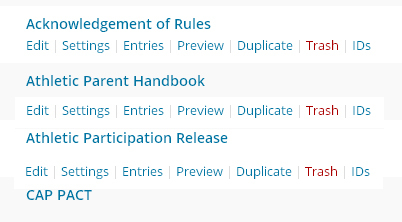 A nice feature within our entries section is the ability to add notes to individual entries. The notes section keeps track of things such as approvals/denials and saves your notes at the bottom of the form. Great for record keeping! All form submissions are collected and stored within the site for easy access, but can be exported into an excel spreadsheet as a .CSV for your own personal database. For those who use 3rd party solutions (Power Schools, etc…), you are able to import information with a few click of your mouse. No more data entry!!! Furthermore, you have the option to select all fields or specific fields for your export. You can also export by selecting a specific date range or simply exporting all submissions. The Power Media team hosts weekly online form demos to help you better understand the capabilities of our forms solution. Whether you are new to Power Media or are looking to get more out of our platform, we will work with you to ensure your comfortable with our online form platform. Demos typically run 15 minutes with extra time for Q & A.